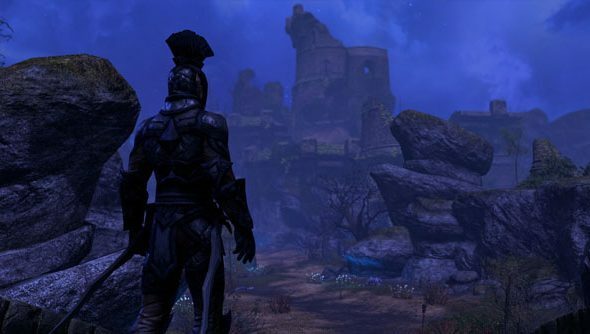 The Elder Scrolls Online is out now; here’s our Elder Scrolls Online review. We’ve seen precious little of The Elder Scrolls Online since its reveal and those initial previews that spurted out onto the internet, except for a few screenshots and a short video, it’s been scarce. So a five minute developer diary on the allied nations of Tamriel is welcome. Frustratingly, the five minutes includes no footage of the game. Nadda. It’s all simply (admittedly, pretty) concept artwork. Nor does it give away anything substantial about how the game will play. We’re told the lore of the four warring factions that make up Tamriel: the Aldmeri Dominion, Daggerfall Covenant, and Ebonheart Pact, who are all opposed to the The Empire for its Daedra-worshipping leader, High King Emeric. While there’s a lot there that’s potentially great for a an MMO, an MMO that is willing to push out the standard remit of MMOs, say by including full-scale PvP wars, at the moment it’s justback story.Back storythat may be painfully related to us throughdialogueboxes from explanation mark-bearing quest givers. So we’re pretty much in the same position as before, waiting to see how the rich story of the past Elder Scrolls games can inform an MMO in the same universe.